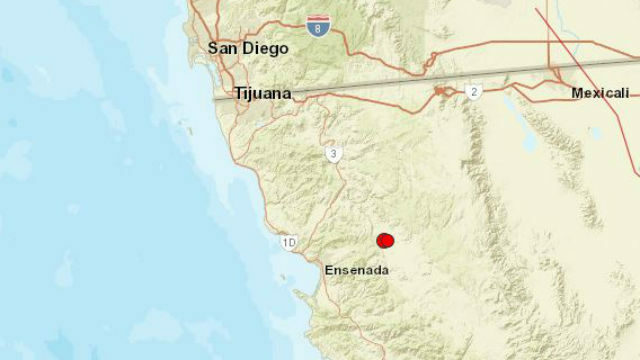 U.S. Geological Survey map shows the location of the earthquakes near Ensenada. A swarm of four earthquakes near Ensenada in Baja California on Wednesday afternoon were felt in the San Diego area. The U.S. Geological Survey reported the quakes measuring 4.2, 2.6, 3.0 and 3.2 magnitude struck between 1:17 p.m. and 1:58 p.m. The largest of the quakes was felt as far north as Oceanside, according to the USGS. There were no immediate reports of damage in San Diego or Mexico. Late Tuesday afternoon there was a 2.7-magnitude earthquake near Calipatria on the Salton Sea.